Bedding Fabrics and Pillows - Choose A Design to Last - Sew What? Sew Anything! Once your youngsters grow out of the Barbie and Spider Man bedding fabric phase, it is a perfect opportunity to redo a bedroom. The easiest thing to do is start with the fabric selection. Choosing bedding fabric for duvets and pillows can be the central design inspiration for the bedroom do-over. The fabric or a coordinating choice can move to the window coverings and even furniture. 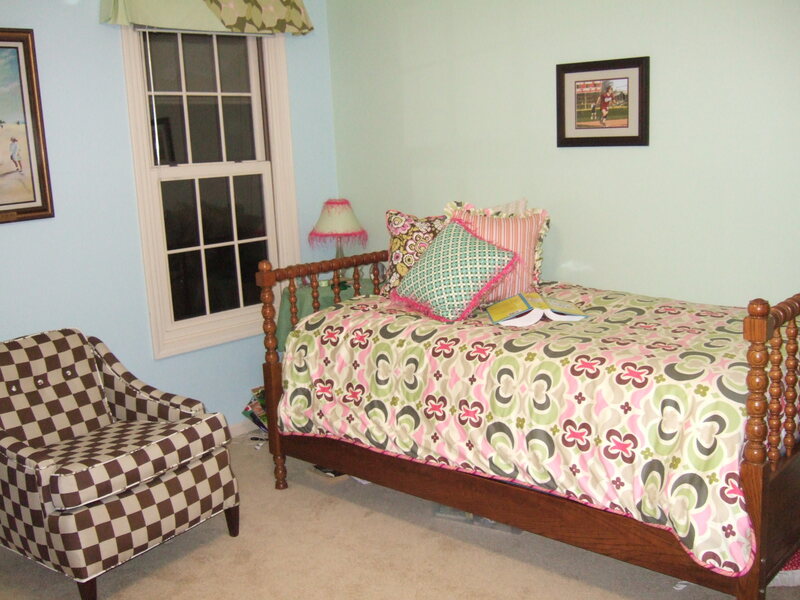 Amy Butler fabrics were used for this great teen bedroom with bedding fabrics for custom duvets and pillows. A duvet covered this twin bed and coordinating pillows. Matching valances were hung over the windows. I also upholstered the chair that is in this room. It all looks really great even the lamp shade that illuminates the room has a custom shade. If only I could have the teen that inhabits this lovely room keep it picked up, Ha! Truthfully, I am happy to have her here even if the room is occasionally messy. Because we chose a quality fabric design I know that this room design will still look good as a guest bedroom, after she is gone off to college. Gulp!